Flight MH17, Ukraine and the New Cold War. Prism of Disaster. 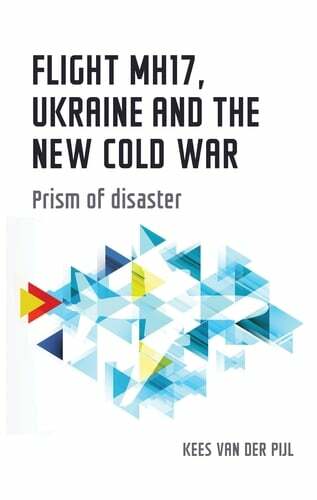 ‘Based on wide-ranging meticulous research, van der Pijl utilises the case of the downing of MH17 as a prism to refract the political corruption of state-directed oligarchic capitalism in Ukraine coupled to the self-interest of a neo-liberal driven European Union. He offers a masterly analysis of the complex domestic personal relationships and class forces involved in the breakup of Ukraine and the wider Soviet bloc, and concurrently the clash by foreign interests for material assets. The discussion of the downing of MH17 is based on a wide range of sources and provides the best available case study of the topic. Van der Pijl’s research raises controversial conclusions both about the validity of the process, the conclusions of the investigation of the crash and the wider motivations of the principal interests. This is a book which can be recommended to students of contemporary capitalism, of the transformation of the socialist block as well as to those concerned with contemporary international affairs. Meanwhile, Washington and a bloc of Baltic states led by Poland and Sweden were crafting a comprehensive Cold War response to Russia’s new contender posture, the Eastern Partnership. Although nominally an EU venture, it was actually an Atlantic undertaking of which Europe was only the subcontractor: the EU would be unceremoniously sidelined when the going got tough—in February 2014. Well before the Georgian debacle, the Bush administration had become sceptical about the outcomes of the Rose and Orange Revolutions. The incoming rulers in Tbilisi and Kiev and the oligarchs seemed interested only in private enrichment. American planners therefore began to devise ways of constitutionalising ‘market democracy’ in post-regime-change states. Dissatisfied with the timid proposals of her initial policy planning director, Secretary of State Condoleezza Rice brought Stanford International Relations scholar, Stephen Krasner, to the State Department in 2005. In his new role, Krasner collaborated with Carlos Pascual, a former director in the National Security Council responsible for Russia, Ukraine and Eurasia, and appointed US ambassador in Kiev in 2000. Pascual was credited with having convinced Kiev to join in the Iraq invasion, amidst general approval for that criminal adventure among governments in ‘the new Europe’. The office’s mandate is not to rebuild any old states… but to create “democratic and market-oriented” ones. So, for instance …, [Pascual’s] fast-acting reconstructors might help sell off “state-owned enterprises that created a nonviable economy.” Sometimes rebuilding, he explained, means “tearing apart the old”. In this strategy, Ukraine’s Naftogaz, the gas and oil holding, was such a ‘state-owned enterprise’ in ‘a nonviable economy’, although, as we will see in chapter 5, the attempt to privatise it would eventually run aground in the face of oligarch resistance. Generally, however, governments in collapsed countries ‘take orders well’. This would apply to all the successor states of the Soviet Union, including Russia under Yeltsin. Given Pascual’s CV and the anti-Russian tendency in Washington, his reasoning also served as a blueprint for intervention in Ukraine to weld democracy promotion, economic warfare and the application of military force into a ‘new art of military intervention premised on the temporary occupation and technocratic reconstruction-reconstitution of illiberal societies’. A state benefiting from this would also find its sovereignty limited, or as Krasner calls it, be assigned ‘shared sovereignty’, ‘a voluntary agreement between recognized national political authorities and an external actor such as another state or a regional or international organization’. The limited sovereignty contract for Ukraine, which its president would step back from signing in 2013, would take the form, paradoxically given its elaboration in Washington, of an EU Association Agreement in combination with a Deep and Comprehensive Free Trade Agreement (DCFTA). It was inscribed in the Eastern Partnership, initiated by the Baltic bloc. The Partnership, an offshoot of the European Neighbourhood Policy of 2004, was added to the ‘multi-layered drive to expand so-called European institutions such as NATO, the European Union, and all the organizations complementing them’. This drive increasingly focused on thwarting the Eurasian Economic Community of Russia, Belarus, Kazakhstan, Kyrgyzstan and Tajikistan, in which Ukraine had obtained observer status in 2002. Its first concrete instalment, a Customs Union, was planned to come into effect in 2009. In May 2008, the Eastern Partnership was offered to six former Soviet republics, Georgia, Ukraine, Azerbaijan and Moldova (the four GUAM states), Belarus (which briefly before had still been branded ‘Europe’s last dictatorship’) and Armenia. It was formally launched at the Prague EU Summit of 2009. Sensing that Ukraine and the Black Sea were key targets in the envisaged Partnership, from which Russia was to be excluded, Moscow countered by proposing a tripartite structure with the EU and Ukraine to modernise the country’s gas pipeline grid and prevent future disruptions of the supply to Europe (as had happened again in January of that year), but this was dismissed. Likewise, Russian proposals floated to investigate the compatibility of the Eurasian customs union and the DCFTA were judged inadmissible from the EU perspective. After the Georgia conflict, Germany and France gave up their opposition to that country’s association with NATO, against a backdrop of urgent expert advice to work for closer ties with Ukraine. The EU became the executor of this essentially Atlantic project at a time when American forward pressure towards Eastern Europe had slackened due to the financial crisis and the US presidential elections and when it was expected that the Bush-era enthusiasm for regime change would be scaled back. The EU had, moreover, abandoned its consensual approach in its drive for a European Constitution. Though it was voted down in referendums in France and the Netherlands in 2005, the EU rammed it though as the Lisbon Treaty without alterations (apart from trivia such as the ‘European anthem’) in 2007. Coming into force in 2009, it required accession countries not only to open their economies but also align their defence and security policies with those of NATO. As we will see in chapter 3, the Baltic bloc would lead the effort of convincing other EU states of the need to draw in Ukraine, whilst the Obama administration was ‘leading from behind’ until it shifted gear following Putin’s return to the Russian presidency in 2012, and actually directed the regime change in Kiev. The EU was launched on the path of geopolitical competition, something for which it was neither institutionally nor intellectually ready. Not only was the Association Agreement incompatible with Ukraine’s existing free-trade agreements with Russia, but there was also the Lisbon [Treaty] requirement for Ukraine to align its defence and security policy with the EU. This was an extraordinary inversion: instead of overcoming the logic of conflict, the EU became an instrument for its reproduction in new forms. Since the US’s aim in this new, third Cold War, like the second, was regime change in Moscow, whilst reining in any independent European posture, it relied on the armour of coercion in every domain, including nuclear weapons. Prof. Kees van der Pijl is fellow of the Centre for Global Political Economy and Emeritus Professor in the School of Global Studies at the University of Sussex.